Michelangelo Buonarroti, The Risen Christ (detail), c. 1532-3. Black chalk on paper. 37.2 x 22.1 cm. Royal Collection Trust / © Her Majesty Queen Elizabeth II 2018. When I write a novel and create protagonists or avatars to embody my ideas and arguments, it is always desirable to access the unknowing parts of their minds, as well as their more conscious motivations. Likewise, it seems to me that at the centre of Bill Viola’s lifelong visual investigation into all the dimensions of consciousness is his interest in human incoherence, the ways in which we misunderstand ourselves and others. Viola searches for a physical grammar, channelled via the bodies of his protagonists, to interrogate enigmatic feelings, those emotions that are mysterious to ourselves as much as anyone else. I believe it is a radical and progressive project (in an increasingly disembodied, corporate world) to dignify the strange conversations that highly charged emotions have with the body and mind. 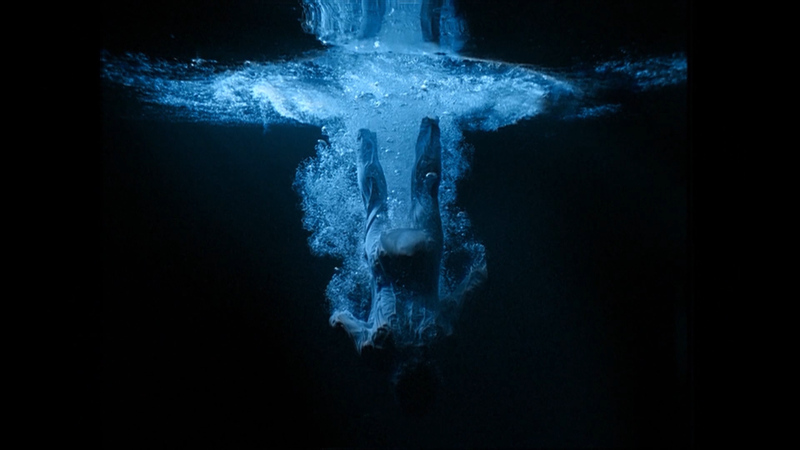 In Viola’s 2001 video diptych Surrender we see two protagonists reflected in water as they formally perform the rituals of some sort of undisclosed suffering. Perhaps the mirroring of grief is a nod to the myth of Narcissus (as told by Ovid) who was unable to separate himself from the allure of his own reflection. Yet, in Viola’s telling, this is not a one-way conversation. Instead there is a (twinned) transmission of intense feeling, of emotions that are bigger than the protagonists themselves. Who have they lost, or what have they lost in each other, and what is the nature of their surrender? It is as if the spectator breathes with them as we gaze at their all too human struggle. If they reach for transcendence, or perhaps redemption, Viola wisely never offers the whole story. We encounter his protagonists caught in an extended, heightened moment of the story. Our emotions often embarrass us because they subvert conscious knowledge and tell us something that is awkward to know, perhaps unacceptable to us. A Viola artwork is not shy of heightened states of feeling. And what do we make of his title, Surrender? To surrender is usually perceived as a personal or political defeat, whereas in Viola’s work, the act of surrendering seems closer to acceptance. His corporeal, flawed protagonists dissolve and refigure in a looped choreography of death (or surrender) and resurrection, which is of course one of Michelangelo’s great themes (The Risen Christ, c.1532-33, pictured above). I suppose the point of being a writer is to give life and language as many dimensions as possible. To do this it is essential to surrender to the idea that human incoherence, which is always twinned with coherence, is what keeps us curious, furious, confused and vitally alive. Performers: John Fleck, Weba Garretson. Video diptych. Courtesy Bill Viola Studio Photo: Kira Perov. Deborah Levy is a Fellow at the Columbia Institute for Ideas and Imagination, Paris. Her new novel, The Man Who Saw Everything, will be published in 2019.